Van Egmond Anthurium Substrate is composed of different coarse raw materials. This makes for an airy, stable structure, which is very important for anthuriums and ferns as these require a high level of moisture. The coarse structure ensures that the plant can obtain water frequently without the potting substrate becoming too fine and too wet. This makes Van Egmond Anthurium Substrate the ideal potting substrate for developing the root system of your anthuriums and ferns. 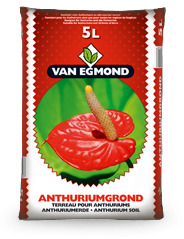 Van Egmond Anthurium Substrate is available in bags of 5 litres. Order anthurium / fern substrate directly through our order form!